478 pages | 69 B/W Illus. All energy sources affect the environment in which we live. While fossil fuels may essentially do more harm, renewable energy sources can also pose a threat to the environment. Allowing for the various renewable energy sources: solar, wind, hydro, biomass, and geothermal, Environmental Impacts of Renewable Energy examines the environmental effects of all available renewable or alternative sources, as they increasingly play a large part in our energy supply, and provides a counterargument about the benefits of renewable energy. This book discusses both the merits and the physical, mechanical, electrical, and environmental limitations of renewable sources of energy. 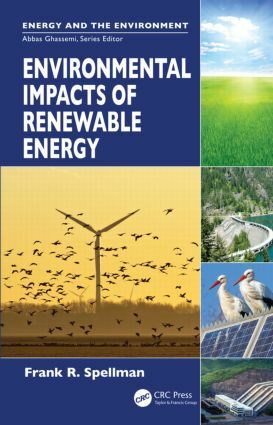 It discusses the pros and cons of renewable energy, addresses environmental issues and concerns, and determines ways to avoid or minimize these impacts. Environmental Impacts of Renewable Energy covers the adverse effects of major renewable energy sources. Environmental engineers working with renewable energy, environmental consultants/managers working with municipalities regarding environmental impact and land use, and undergraduate students taking related courses in environmental college programs can greatly benefit from this text. "… details the theoretical and practical aspects of the development and use of renewable energy… Spellman offers anecdotal sidelights and highlights hazards and safety measures; e.g., readers are warned that solar panels should never be carried by hand while climbing a ladder. … this book will serve as a resource for engineers, scientists, and indeed anyone interested in environmental studies." "This book encompasses all aspects of renewable energy. …Topics covered use real life examples, and start out with a historical perspective. …With renewable energy becoming so important due to rising energy costs, this book provides a go to resource for information for both safety professionals and management." Although geothermal energy has a proven history, environmental disruption remains a factor, and smaller and more versatile sources such as fuel cells may become widespread. Including basic definitions, tables, and diagrams, this book will serve as a resource for engineers, scientists, and indeed anyone interested in environmental studies.Summing Up: Recommended. All readers. "This book makes for very interesting reading and is well worth ownership." Frank R. Spellman, PhD, is a retired assistant professor of environmental health at Old Dominion University, Norfolk, Virginia. The author of more than 90 books covering topics ranging from concentrated animal feeding operations (CAFOs) to all areas of environmental science and occupational health, he has been cited in more than 450 publications, and is a co-author to well-recognized experts in various scientific fields. For example, he is a contributing author of The Engineering Handbook, 2nd ed. Spellman holds a BA in public administration, a BS in business management, an MBA, and both an MS and a PhD in environmental engineering.